2014 marks one hundred years since the British involvement in World War I. 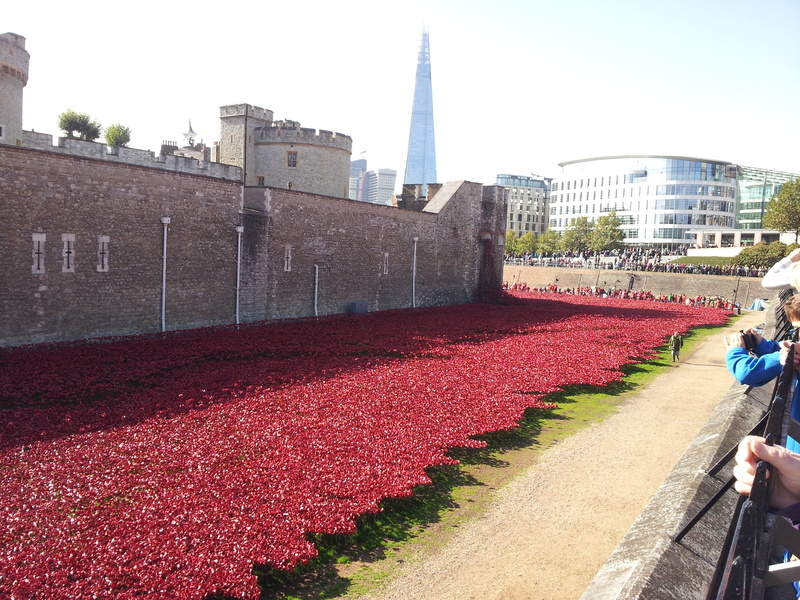 Historic Royal Palaces and the Tower of London are commemorating this with an art installation at the Tower, Blood Swept Lands and Seas of Red. Ceramic poppies will be placed in the Tower’s moat each day until 11 November, Armistice Day. I went to Tower Hill today to see this poignant reminder of the cost of war. As you exit the Tower Hill tube station, you go round the corner to your left and pass under a subway (pedestrian underpass) to reach the Tower. The first sight of this leaves you awestruck. 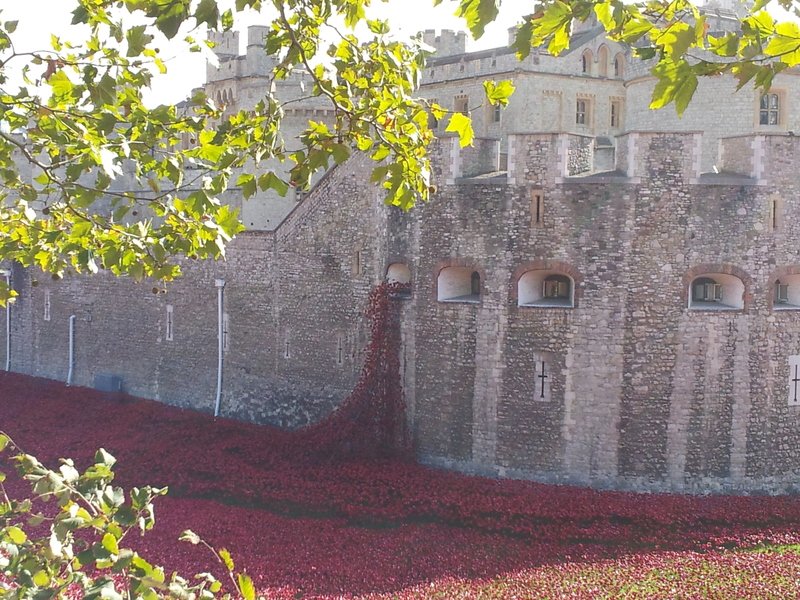 Thousands of poppies, one for every British casualty of World War I, glow red in the sunshine. They lap against the base of the tower like a bloody river. The thought that there were enough casualties to fill the moat is a sobering one. There were 888,246 of them. Here is a Telegraph article about the installation. Poppies spill from the Tower as though it were bleeding. I didn’t go into the Tower, as I’d been there before the last time, and I had other things I wanted to do today. But I wanted to see the poppies, and I promised my mum I’d get pictures of them. After this, I got on the RV1 bus from Tower Gateway and went to the Fashion and Textile Museum on Bermondsey Street. One thing about London–the streets are NOT laid out in a grid fashion as many American cities are, and it’s extremely easy to walk right by the road you want and not even see it. Especially when it’s raining and blowing on you. 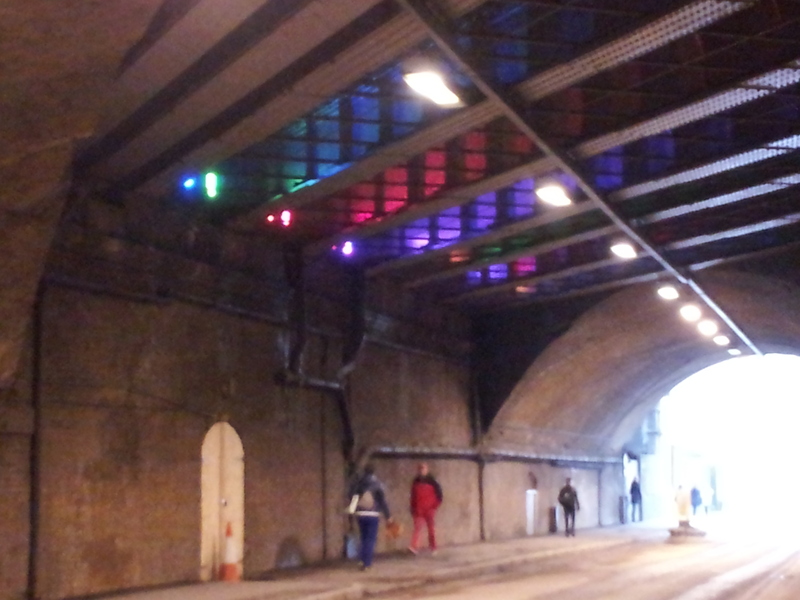 When you walk back from the museum under the bridge on Bermondsey Street, this is what you see. Pretty neat, huh? The museum had a knitwear exhibition on right now. Though it mainly showcased designer clothing that influenced the fashion, it was still easy to see where the trickle-down to the common closet came from. As I walked through the 1970s part of the exhibit, I remembered some of the things I’d forgotten about what we wore back then. Secret Book is set in the 1970s, so I took plenty of notes. Now that I’ve done some actual research, if I sell it maybe I can write off this trip, ha ha. A taste of the exhibit. Though small, it was really interesting. After I saw the exhibit, I walked back through the rain and caught the bus back to Tower Gateway. I stood in the subway for a moment to look something up on my map, and I heard thunder! Just once–at first I heard a bus go over the roadway, but then it actually thundered. London has had plenty of storms this summer, but I guess that caught everyone by surprise. For the last couple of days, it’s been raining on and off, but nothing growly until today. 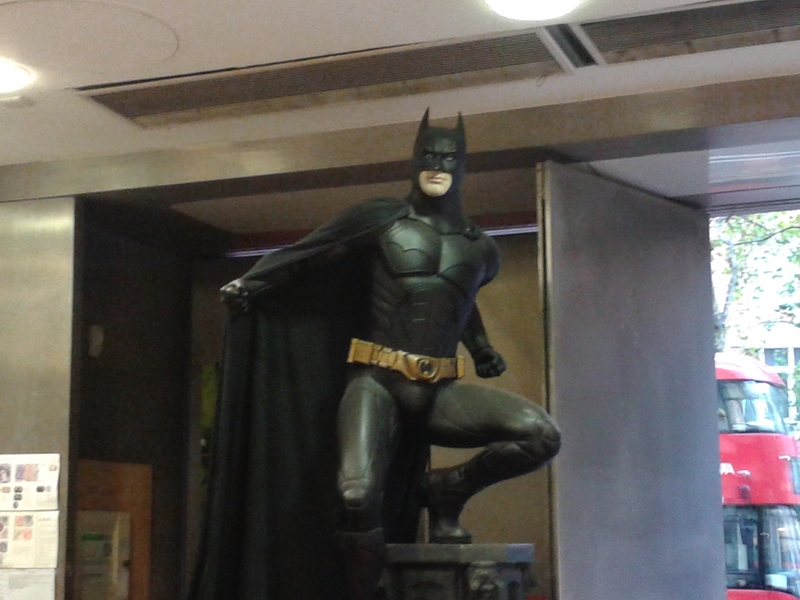 My final stop for today was Forbidden Planet, a geek store on Shaftsbury Avenue near (okay, not so near) Leicester Square. The Square is a tourist area packed with crap that you do not need. There were spring rolls. Om nom nom. It smelled great, so I peeked in the window. 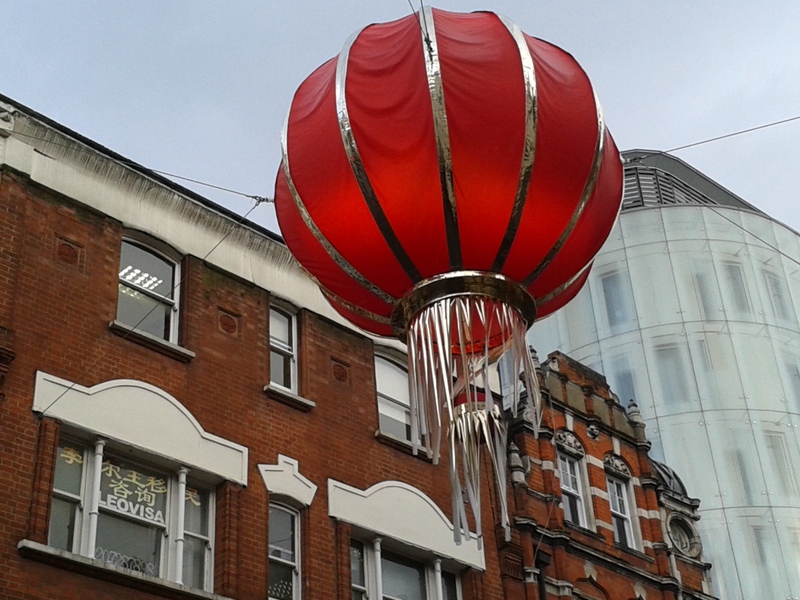 A number of Asian customers were inside, which in Chinatown would be a good sign, and a few tourist-looking ones. I made a mental note of the location and walked back along the avenue until I found the shop. Forbidden Planet is Nerdvana. It’s full of all kinds of geek, nerd, gamer, comic lover, and fan gear of all persuasions–Star Wars, Doctor Who, Adventure Time, and more. They have book signings all the time and ship all over the place. This guy must like it too. I bought some Doctor Who loot. 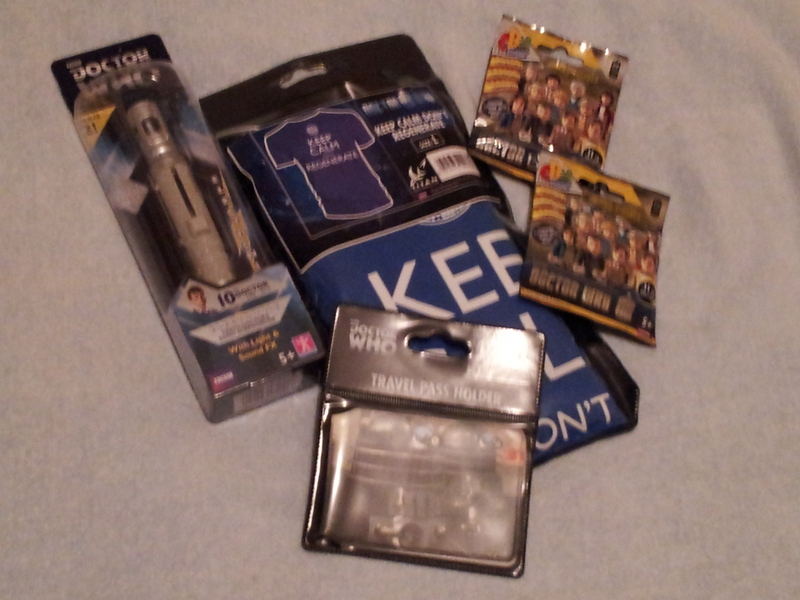 Clockwise from left: a Tenth Doctor sonic screwdriver (it extends, according to Mike who works there), a t-shirt that says “Keep Calm Don’t Regenerate,” tiny Doctors in a pack, and a travel pass holder with Daleks on it. Not pictured: the Gryffindor travel pass holder I bought for my Oyster card. 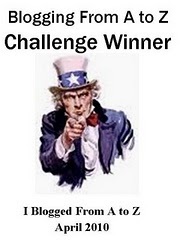 Sadly, I only have a couple more days to use it, but I’ll save it for next time. 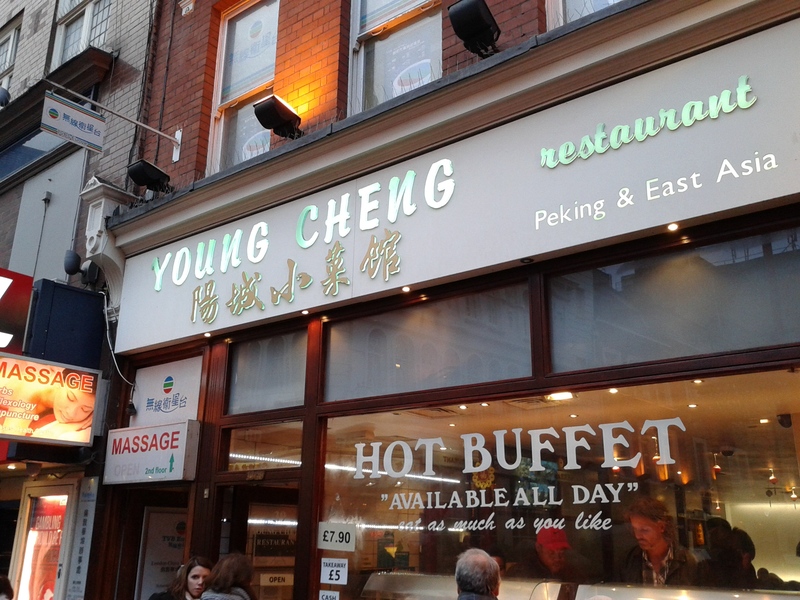 Before I went home, I retraced my steps to Chinatown and had a delicious dinner at Young Cheng Restaurant. It’s a chain, apparently, but the food was good and the service was polite and fast. It’s nothing fancy, but it’s a good, filling buffet and you can eat as much as you like. For a tenner, I had a very decent dinner. I think it would be a great place for lunch if you worked in the area. Then I walked along the Chinatown street and bought a Korean pear at a small market. I love those–they’re very crunchy and good. I discovered them at the Japanese market in my city. 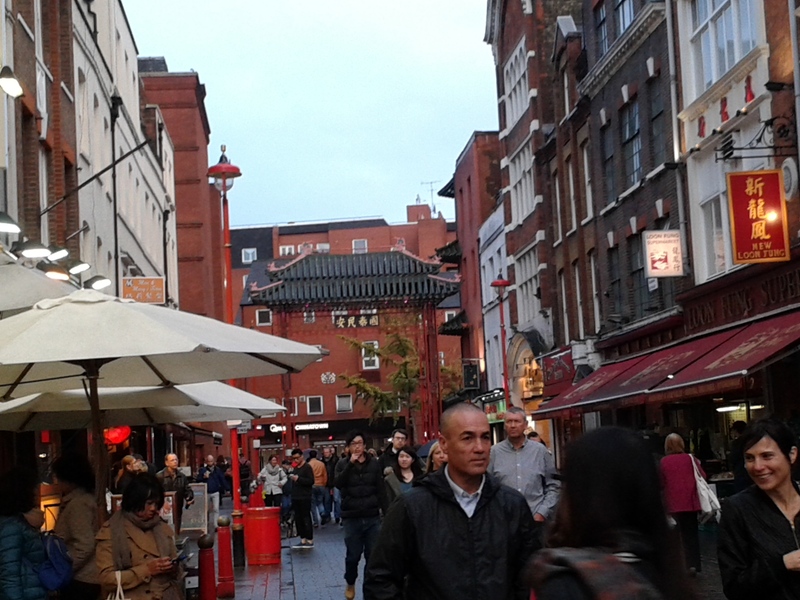 A view down the Chinatown street. Tomorrow, I tour the BBC. With any luck, I’ll have time to cram a pub or restaurant visit in afterward. I still have a lot bookmarked on my London map. There’s no telling what I’ll see and I may only have a few photo opportunities at the studio, but I’ll try to tell you as much as I can.